Born in the The Biggest Little City in the World, Reno, Badlands started life in a small motorcycle shop when founder Rick Eckhardt developed his first load equalizer. Since that fateful day in 1990 Badlands has grown extensively to cover a whole host of V-Twin lighting and wiring needs. In 20016 the fledgling company was sold to Dan Lewis who had the technical know now to take Badlands to the next level; developing run/brake/turn signal modules and building a firm foundation for the company's success. 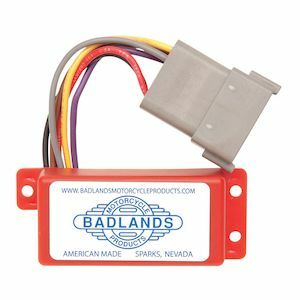 2013 saw the acquisition of Badlands by NAMZ Custom Cycle Products who was able to package their custom wiring harness with the Badlands modules to make adding custom lighting to your bike even easier. Since then, Badlands has continued to grow, becoming a staple amongst Harley-Davidson riders all over the US and the world.